It took a while, but I'm finally blogging about the 14-day water fast I did in May. I've done several fasts over the years--from 1-day fasts a couple times per week to 21-day fasts. Usually, I'm fine when fasting--except for low blood pressure every now and then. However, the 14-day water fast I did in May was the hardest I've ever done. I felt faint a lot but it was only after I broke the fast on day 15 that I realised the weakness I suffered was due to imbalanced electrolytes. I then spent a couple of months getting my electrolytes sorted before embarking on a second 14-day fast. This time, I was absolutely fine. It's amazing how something as simple as electrolytes can make such a huge difference to how we feel on a fast. 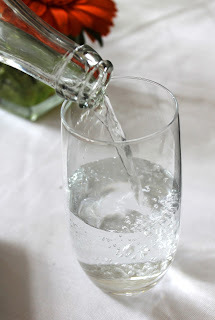 I know some of you were interested to read my promised blog post about the healing I got from my May water fast so I won't keep you waiting any longer. I had two main health problems I wanted to tackle. The first was long-term lower back stiffness. Some days it was so bad I couldn't bend. I've always been quite limber so when my back started stiffening up it was a bit shocking. Nevertheless, I accepted it as middle-age aches. The second problem I had was a pinching pain on the left side of my lower abdomen. It started the day I gave birth to our last baby 16 years ago. Over the years, the pain seemed to be located in or around my ovary. When I mentioned the constant pain to my doc shortly after giving birth, I was told that they'd keep an eye on it and if the pain persisted and was still present six weeks postnatal, they'll investigate. Needless to say, they never bothered and I lived with the discomfort, perpetually thinking it would disappear at any moment. So, skip forward 16 years and a 14-day water fast. As I already mentioned, the fast was pretty rough-going. I think the May fast is the first time I fasted into my monthly cycle. Coming up to my cycle's due date I had a lot of pain in the left ovary area--much worse than I'd ever experienced before. In an effort to avoid being too graphic, that monthly passed a lot of tissue-like substance and the pain suddenly disappeared. I haven't had a single twinge since. And my back stiffness is all but gone. I know some people think water fasting is a waste of time, but I truly believe it is The #1 way to repair the body quickly. No one can tell me that fasting didn't eliminate the whatever it was that had been causing me such discomfort for 16 years. The second 14-day water fast was just as amazing for results. I'd been liver and gallbladder cleansing monthly this year and it so happened that the week of my liver and gallbladder cleanse crossed paths with my water fast. In preparation for the cleanse I'd been drinking Apple Cider Vinegar four time a day while fasting. To my great surprise, on day five I passed rope worms! Since then I have not had one single problem with candida! After researching rope worms, I discovered that they are responsible for candida overgrowth--something I'd been battling to heal for many years. Little did I know that the solution would come in such a simple fix! This is why I'm now committed to continually water fasting throughout the rest of my life. I hope this short recap helps someone. If you are thinking of water fasting please, please, do in-depth research and speak with your health practitioner before attempting any kind of self-help. This is my own experience, for which I take full responsibility. I am not suggesting that anyone should water fast, I'm simply sharing my experience. If you've had great results from water fasting I'd love for you to share your experience with me in the comments section below.